Set of 3 Heavy Duty 30 litre Pots - These 30 litre heavy duty pots are made to last for up to 10 years and are totally frost proof. Each pot is specially designed with drainage holes underneath and at the side to prevent plants becoming water logged. ou could also grow strawberries, and tomatoes in them and they are deep enough to support canes to grow Raspberries or Runner Beans or Peas. Supplied as 3 Heavy Duty Pots. 30 litre capacity. Height 37cm Diameter 40cm. 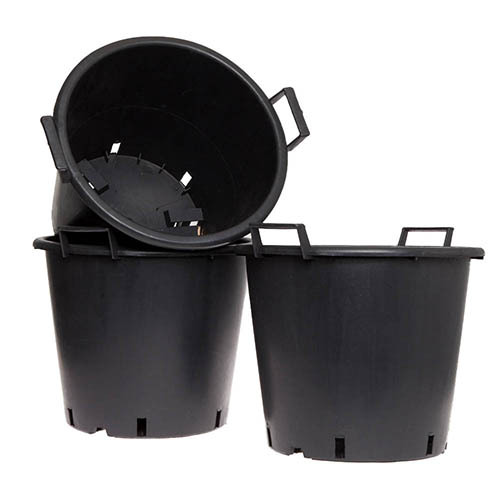 These 30 litre heavy duty pots are made to last for up to 10 years and are totally frost proof. They are frequently used by professional growers, where they are intended to last the entire time a tree or large plant will be growing on the nursery - which shows just how good they are! They have strong 'grab handles' on either side, which make it quick and easy to move them around whenever you need to do so. They also have pre-formed drainage holes on the bottom and side of the pots to ensure your plants will never become waterlogged because any excess water can freely drain away. They are the perfect solution for growing fruit trees and other trees and shrubs but can even be used for colourful summer flowering displays of patio plants, strawberries or perhaps even a wigwam of long-can raspberries! Supplied as 3 Heavy Duty Pots. 30 litre capacity. 2 grab handles and 6 drainage slots per pot. Diameter approx 40cm. Height approx 37cm including handles.